Back today with another card for the card making challenge I've been posting about. You'll notice (obviously) I'm not 100% focused on this challenge and I am doing other things in between posts. This is definitely how I prefer it. The challenge is keeping me going when I want to make something but am not sure what that is, and it is getting me to use products and try techniques I haven't used often or tried before, which is perfect. It doesn't need to be a "I am only doing this until I'm done" kind of thing. The challenge was to use a frame somewhere on your project. I pulled out the Stampin' Up! On Film Framelit dies I have had for a few years (I got them back when I used to do Project Life because having polaroid photos and frames in your pockets was the cool thing to do) but I'm not sure I ever really used them. Unfortunately they are retired but I have seen them on eBay...and I may be destashing my set at some point. I have a bunch of crafty things to destash, just trying to figure out the best way to do so. Anyway, my frame is using white card stock and the polaroid shaped die from the On Film set. Behind that, I've used the Lawn Fawn Stitched Cloud Backdrop die and Stampin' Up! Marina Mist card stock to create a cloud background. 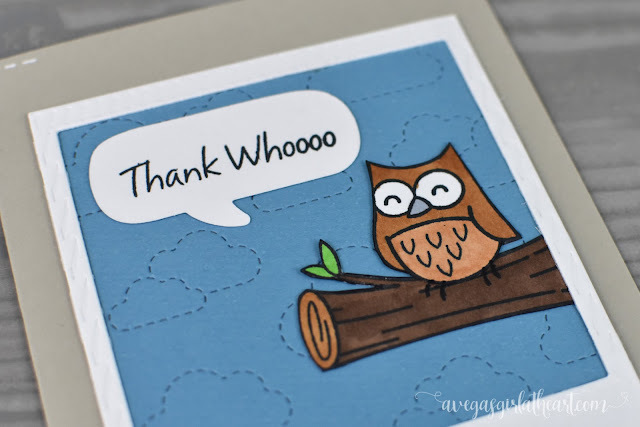 I stamped my owl and "branch" (log?) from the Lawn Fawn Critters in the Forest stamp set, and colored them with Copic and Spectrum Noir markers. 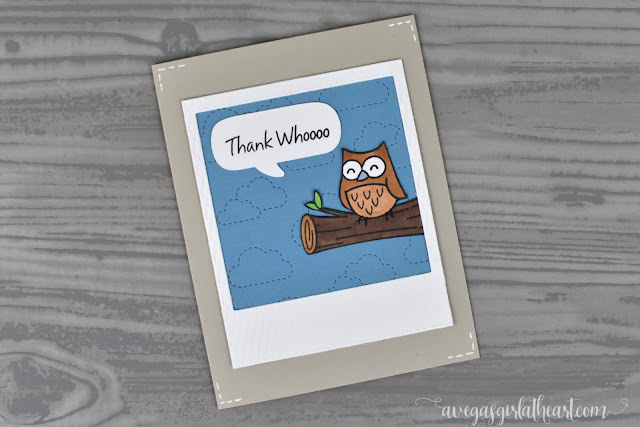 I tried die cutting the owl out, but then realized the matching dies didn't come with one for the branch, which meant I had to cut it by hand, and because I cut so close to the edge, it looked weird having the owl with a white border around him. So I ended up cutting around him too. The Thank Whoooo sentiment is from The Stamps of Life's owls2love stamp set, and it is stamped on a quote bubble cut from the Lawn Fawn A Birdie Told Me die set. 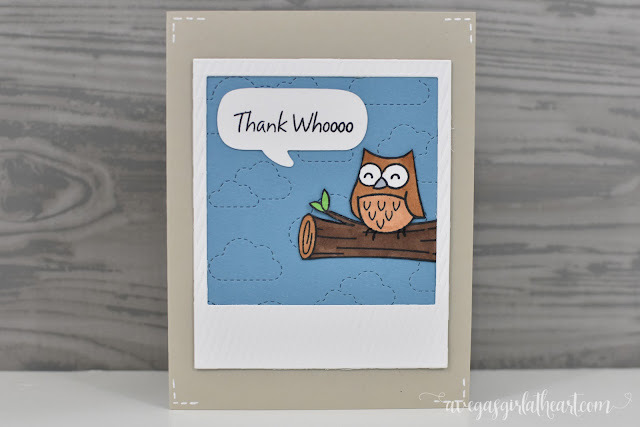 I placed all of this on a card base using Stampin' Up! Sahara Sand card stock. Then, to finish the card, I just added some white dashed lines in the corners using a Gelly Roll white pen. It's kind of simple in that it was easy to create and there aren't any extra embellishments, yet not so much when you look at the scene that I created in the middle. I filmed myself making this card (no voiceover), so please take a look!